I have a quick and easy card to create today using a fabulous Unity Stamp Company sentiment kit and Assemble This! Sketch no. 7. 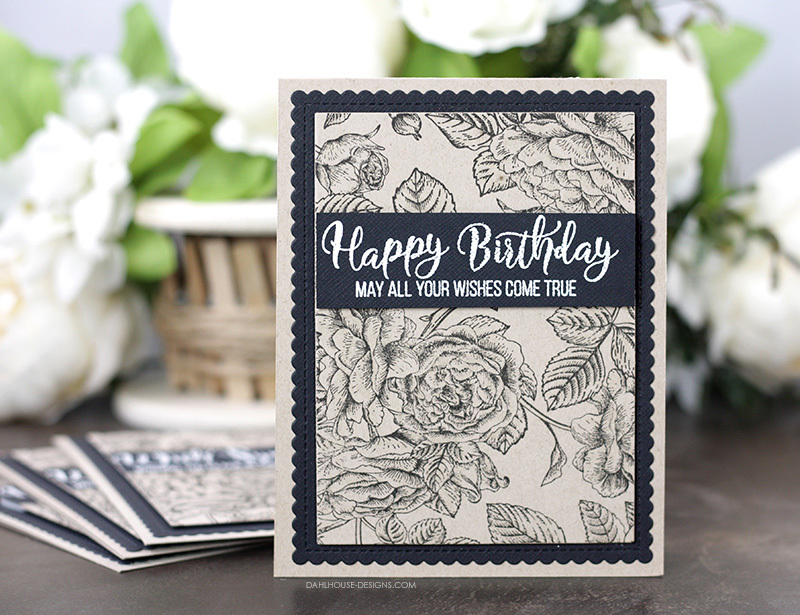 It is a great design to keep around in case you need to make a card last minute. Do you ever wait till the very last minute to make a card? I do. Lots. Sometimes I literally make one right before we head out the door. While it is it not my favorite way to create – I much prefer to build up my stash – I have been known to do it a time or two. That is what this stack of cards are all about. One amazing layout that is super quick and easy, yet beautiful enough to give away. All you need are the perfect stamps, like the ones I used from Unity. Start with a standard size A2 card (4.25″ x 5.5″) card in kraft cardstock. 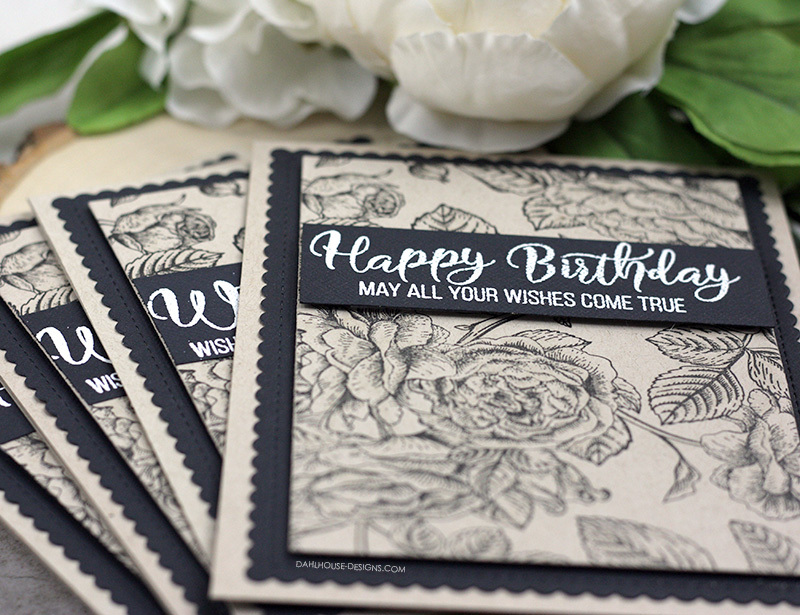 Die cut a scallop rectangle in black cardstock and glue directly to the card front. Stamp background stamp onto kraft cardstock with black in. Trim down so it fits inside the stitched portion of the scalloped black rectangle. Adhere to card with foam adhesive. Stamp sentiment on strip of black cardstock with Versamark ink. Heat emboss with white embossing powder. Trim down to the same width as the floral panel of cardstock and pop up on the card using foam adhesive. Add some glitter to the floral background using a clear Wink of Stella pen. Unity Stamp Company usually has a new sale EVERY Thursday to Monday Midnight. Check the website for details & freebies. Stamp sets go on and off sale all the time, so just add it to your wishlist if not on sale this week so you get a great deal. What a wonderful idea and a beautiful result Lisa! Very pretty, Lisa! My kind of card – to the recipient, looks more complicated to make than it actually is. 😉 That is a gorgeous floral background!